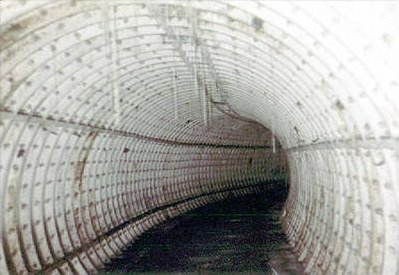 As something of a sequel to BLDGBLOG's earlier post, Britain of Drains, we re-enter the sub-Britannic topology of interlinked tunnels, drains, sewers, Tubes and bunkers that curve beneath London, Greater London, England and the whole UK, in rhizomic tangles of unmappable, self-intersecting whorls. 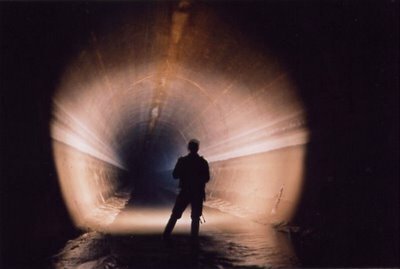 [Images: The Bunker Drain, Warrington; and the Motherload Complex, Bristol (River Frome Inlets); brought to you by the steroidally courageous and photographically excellent nutters at International Urban Glow]. 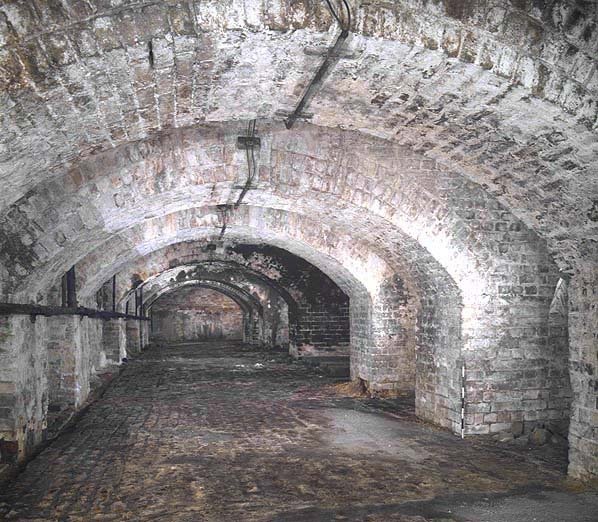 Whether worm-eaten by caves, weakened by sink-holes, rattled by the Tube or even sculpted from the inside-out by secret government bunkers – yes, secret government bunkers – the English earth is porous. 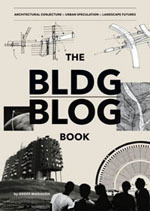 "The heart of modern London," Antony Clayton writes, "contains a vast clandestine underworld of tunnels, telephone exchanges, nuclear bunkers and control centres... [s]ome of which are well documented, but the existence of others can be surmised only from careful scrutiny of government reports and accounts and occassional accidental disclosures reported in the news media." [Images: Down Street, London, by the impressively omnipresent Nick Catford, for Subterranea Britannica; I particularly love the multi-directional valve-like side-routes of the fourth photograph]. 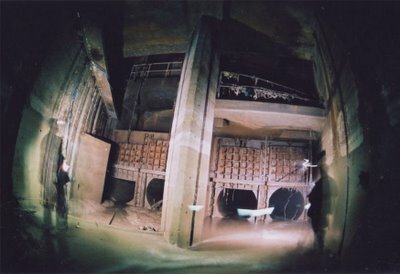 This unofficially real underground world pops up in some very unlikely places: according to Clayton, there is an electricity sub-station beneath Leicester Square which "is entered by a disguised trap door to the left of the Half Price Ticket Booth, a structure that also doubles as a ventilation shaft." This links onward to "a new 1 1/4 mile tunnel that connects it with another substation at Duke Street near Grosvenor Square." But that's not the only disguised ventilation shaft: don't forget the "dummy houses," for instance, at 23-24 Leinster Gardens, London. Mere façades, they aren't buildings at all, but vents for the underworld, disguised as faux-Georgian flats. (This reminds me, of course, of a scene from Foucault's Pendulum, where the narrator is told that, "People walk by and they don't know the truth... That the house is a fake. It's a façade, an enclosure with no room, no interior. It is really a chimney, a ventilation flue that serves to release the vapors of the regional Métro. And once you know this you feel you are standing at the mouth of the underworld..."). [Image: The Motherload Complex, Bristol – again, by International Urban Glow]. 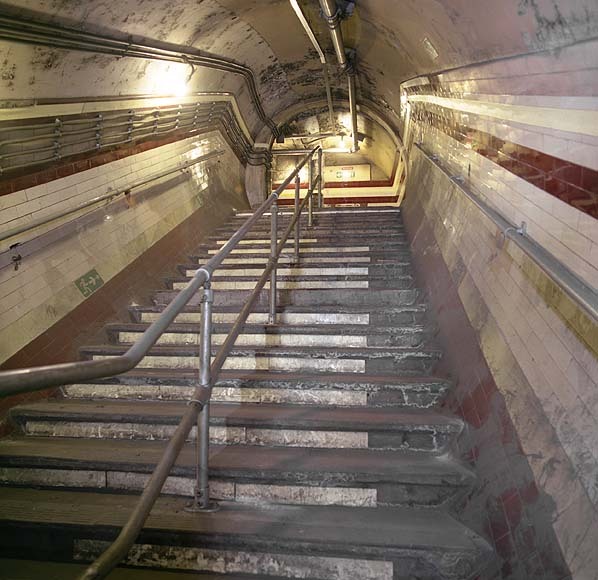 There is also a utility subway – I love this one – accessed "through a door in the base of Boudicca's statue near Westminster Bridge." (!) 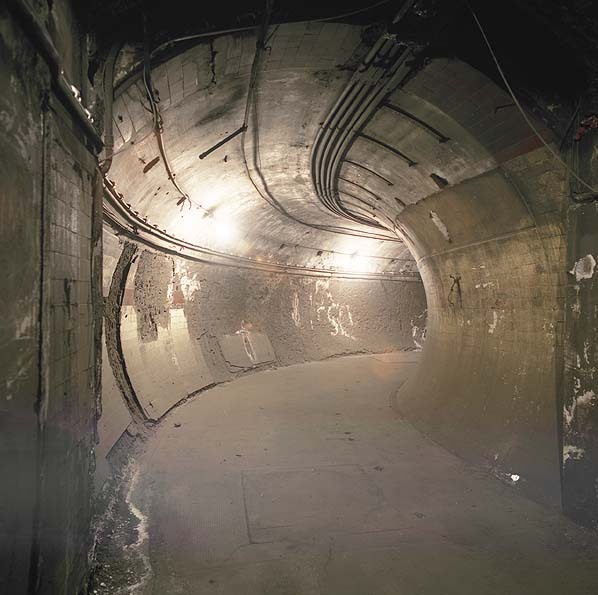 The tunnel itself "runs all the way to Blackfriars and then to the Bank of England." 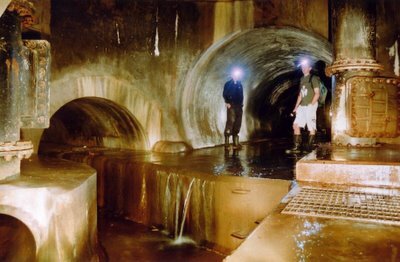 [Images: The Works Drain, Manchester; International Urban Glow]. 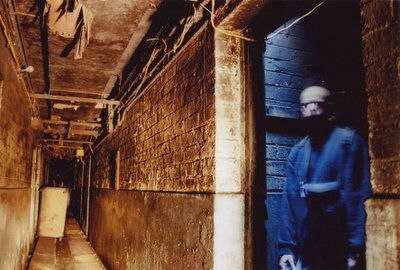 My personal favorite by far, however, is British investigative journalist Duncan Campbell's December 1980 piece for the New Statesman, now something of a cult classic in Urban Exploration circles. 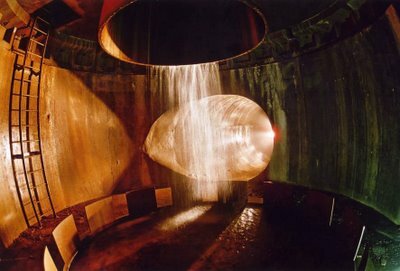 [Image: Motherload Complex, Bristol; International Urban Glow]. 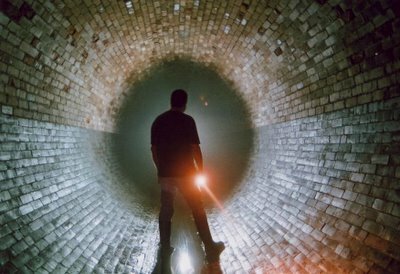 "Entering, without permission, from an access shaft situated on a traffic island in Bethnal Green Road he descended one hundred feet to meet a tunnel, designated L, stretching into the distance and strung with cables and lights." He had, in other words, discovered a government bunker complex that stretched all the way to Whitehall. On and on he went, all day, for hours, riding a folding bicycle through this concrete, looking-glass world of alphabetic cyphers and location codes, the subterranean military abstract: "From Tunnel G, Tunnel M leads to Fleet Street and P travels under Leicester Square to the then Post Office Tower, with Tunnel S crossing beneath the river to Waterloo." 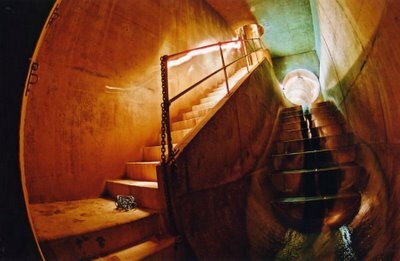 [Image: Like the final scene from a subterranean remake of Jacob's Ladder (or a deleted scene from Creep [cheers, Timo]), it's the Barnton Quarry, ROTOR Drain, Edinburgh; International Urban Glow]. Here, giving evidence of Clayton's "accidental disclosures reported in the news media," we read that "when the IMAX cinema inside the roundabout outside Waterloo station was being constructed the contractor's requests to deep-pile the foundations were refused, probably owing to the continued presence of [Tunnel S]." [Image: Motherload, Bristol; International Urban Glow]. But when your real estate is swiss-cheesed and under-torqued by an unreal world of remnant topologies, the lesson, I suppose, is you have to read between the lines. A simple building permissions refusal might be something else entirely: "It was reported," Clayton says, "that in the planning stage of the Jubilee Line Extension official resistance had been encountered, when several projected routes through Westminster were rejected without an explanation, although no potential subterranean obstructions were indicated on the planners' maps. According to one source, '...the rumour is that there is a vast bunker down there, which the government has kept secret, which is the grandaddy of them all.'" 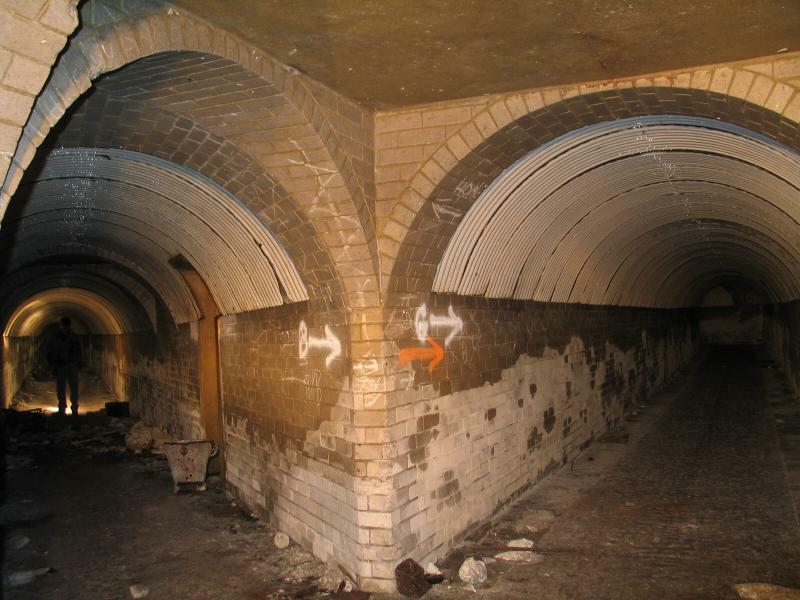 [Image: The Corsham Tunnels; see also BLDGBLOG]. Continuing to read between the lines, Clayton describes how, in 1993, after "close scrutiny of the annual Defence Works Services budget the existence of the so-called Pindar Project was revealed, a plan for a nuclear bomb-proof bunker, that had cost £66 million to excavate." All of these places have insane names—Pindar, Cobra, Trawlerman, ICARUS, Kingsway, Paddock—and they are hidden in the most unlikely places. Referring to a government bunker hidden in the ground near Reading: "Inside, they tried another door on what looked like a cupboard. 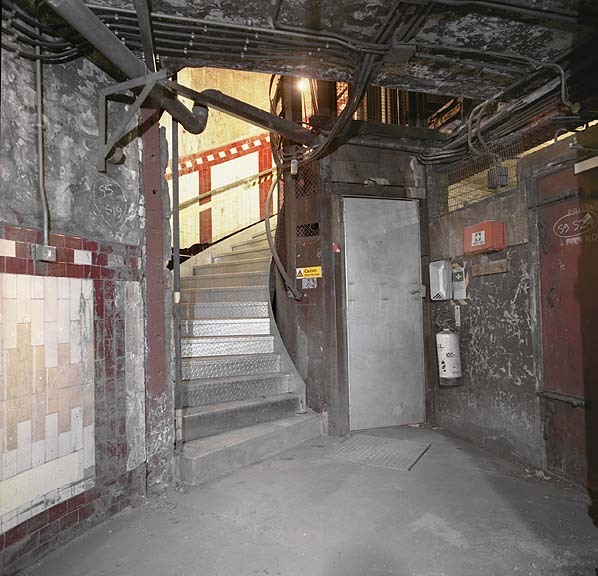 This was also unlocked, and swung open to reveal a steep staircase leading into an underground office complex." 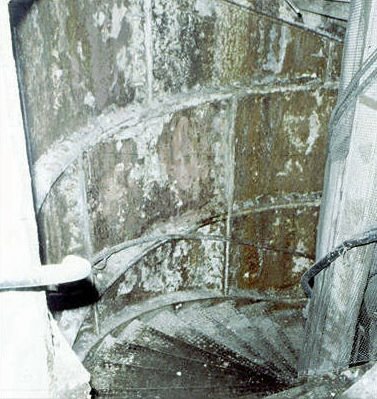 [Images: The freaky stairs and tunnels, encrusted with plaster stalactites, of King William Street]. Everything leads to everything else; there are doorways everywhere. It's like a version of London rebuilt to entertain quantum physicists, with a dizzying self-intersection of systems hitting systems as layers of the city collide. [Image: Belsize Park, from the terrifically useful Underground History of Hywel Williams]. There is always another direction to turn. [Image: The Shorts Brothers Seaplane Factory and air raid shelter, Kent; photo by Underground Kent]. This really could go on and on; there are flood control complexes, buried archives, lost rivers sealed inside concrete viaducts – and all of this within the confines of Greater London. 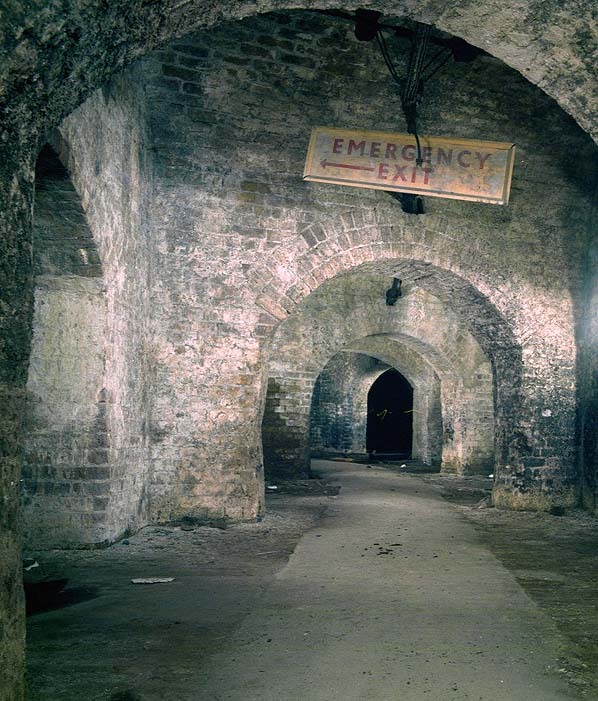 [Images: London's Camden catacombs – "built in the 19th Century as stables for horses... [t]heir route can be traced from the distinctive cast-iron grilles set at regular intervals into the road surface; originally the only source of light for the horses below" – as photographed by Nick Catford of Subterranea Brittanica]. [Image: Main Junction, Bunker Drain, Warrington; International Urban Glow]. 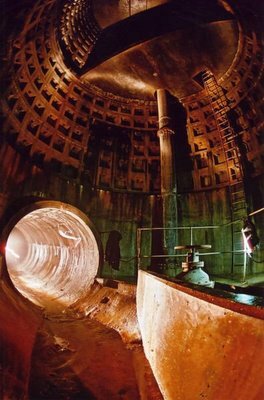 And for all of that, I haven't even mentioned the so-called CTRL Project (the Channel Tunnel Rail Link); or Quatermass and the Pit, an old sci-fi film where deep tunnel Tube construction teams unearth a UFO; or the future possibilities such material all but demands. 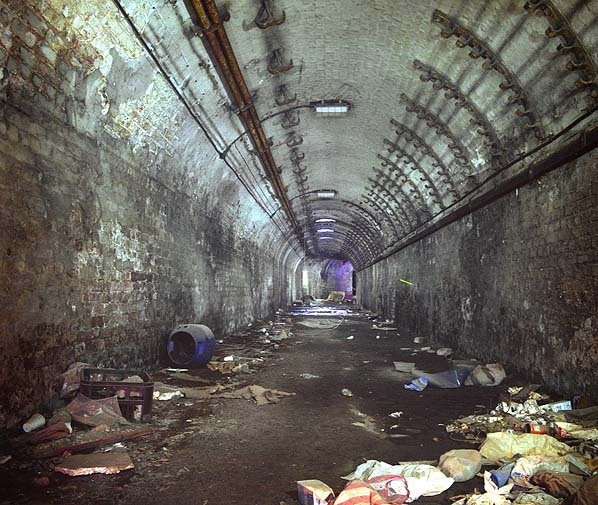 [Image: Wapping Tunnel Vent, Liverpool, by International Urban Glow; a kind of subterranean Pantheon]. What about Neil Gaiman's Neverwhere? It's a great novel about underground London. 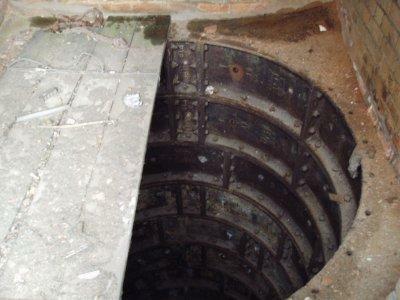 what degree of urban exploration expertise is required to reach these catacombs? it sounds fascinating, not that I'm going to be jetting off to London anytime soon, but it'd be a fun way to spend a day on a vacation. chicago has one or two weird tunnels, and supposedly, there is a mythical dairy queen down there somewhere. we've never been able to find it. 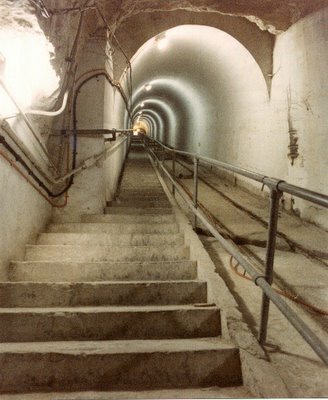 northwestern university also has some infamous underground tunnels, or at least, they were infamous when i went there about seven years ago. Geoff, have you been under the post office yet at 30th? your game, then, could be played live, in person, while players simultaneously create the game world by exploring the bunker system at the same time, opening up the map, all the while watching icons of your enemies appear and move around on a cell phone mapping gadget, manuevering and sneaking up on you somewhere nearby. a live real-time real-place urban exploration first-person shooter game, by BLDGBLOG of course. * also, on the subteranean tip, did you ever hear about this dude? his book i think is only available in japanese, and he has faced some intense governemnt scrutiny. i dont know he may be a quack, but here's the article in case you hadnt come across it before. 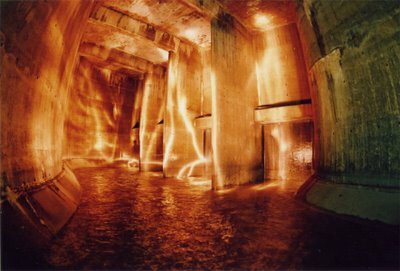 The Secret World of an Underground Tokyo. Matt - You'd need Band-Aids/plasters, anti-bacterial cream, some extra batteries, a hat. Lots of batteries, actually. A tetanus shot. Maybe a shotgun. A flashlight/torch to put those batteries in, of course. And don't forget the digital camera. Waterproof boots - and bring a friend. Don't watch zombie films for at least three weeks prior to excursion. And colored chalk can help for navigation purposes... Bring aspirin. And, bfunkitecturious, that Japan article is nuts! Straight out of Jules Verne. Jules Verne meets Haruki Murakami - an interesting prospect, by the way. And I've never read the Neil Gaiman book. It's good? I'll check it out. yeah, i haven't hear anything more about Shun Akiba since. seems like a freaky disappearance for someone with such a crazy project. but you can get your hands on his book here, but you gotta read japanese. even though the pictures and maps and overlays of missing-tunnels, censored -corridors, vanished street blocks, his whole vast secret underworld template of cortographic discrepency, would be pretty intriguing to see. 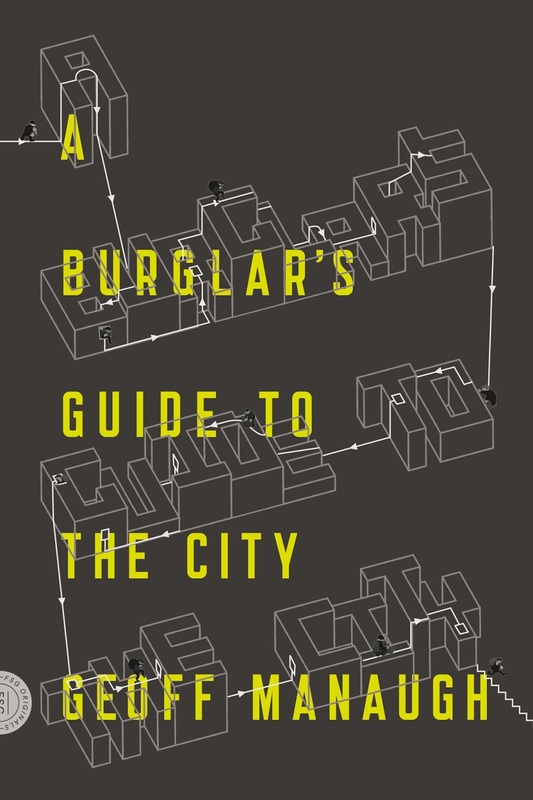 mapping erasure and a residual subterranean urbanism, a blueprint of ommitted places, the japan's secret CIA prison spaces, cities inferred, or alas remembered, only by their disappearing traces on old maps, i would love to check it out! but, strange no one here in the States really talks about him. If you can find it, I recommend reading 'The Third Level' by Jack Finney. Rumors that the Caverns of Sonora in central Texas connect to Carlsbad Cavern in SE New Mexico... and now to the London underground complex, humanity excreting its second nature of unmapped subterranean worlds. Any new species of white crickets down there? Don't know about the crickets, but London under's got its own species of mosquito. And the linked Texas/New Mexican caverns... quite a thought. Neverwhere the book is indeed quite good. There's also the BBC miniseries, which Gaiman actually wrote before the book, and which is also extremely good. This also reminds me of the discovery of a secret underground movie theater in a large cavern beneath Paris a couple years back. It's things like this that cause me to open all the cupboards/wardrobes at my friends' houses. Well not quite, but it certainly makes for a curious chain of thoughts. There used to be a tourist company which used to do a tour of the old catacombs of Edinburgh. Basically, they had bought out an old building which had three floors of basement (a couple of floors had actually collapsed due to neglect). Entry was through a spiral staircase which went down three levels. While the main theme of the tour was ghosts and spooks (the spiritual kind), the history lesson was amazing. It was incredible to realize that an old hillside path which used to have a grand view of Edinburgh, was now completely buried under three levels of buildings (fortunately, artists had captured the view in large panoramic paintings). Due to population growth, the poorest families ended up living in storage basements. After the great plague, the whole area was sealed off and used as a foundation for new buildings. So what appears to be street level is in fact three or four floors up. Just out of interest where did this quote or info source come from? 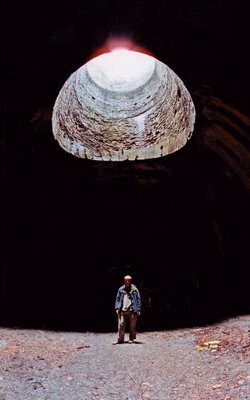 Entering, without permission, from an access shaft situated on a traffic island in Bethnal Green Road he descended one hundred feet to meet a tunnel, designated L, stretching into the distance and strung with cables and lights." He had, in other words, discovered a government bunker complex that stretched all the way to Whitehall. This place could be a other city from a movy about of future, this is astonishing landscape. This is a real Underwordl. I can't imagine how couldo be so big!! 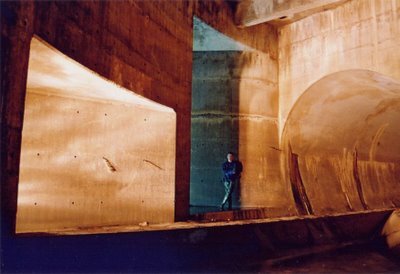 Just HOW BIG do you think that all of the tunnels (hidden/non-public, of course..) combined are? 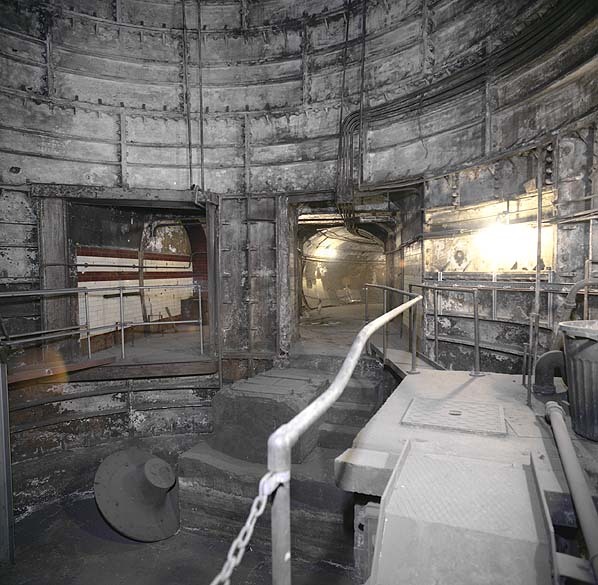 On another note, I feel kind of stupid asking about it, but it seems like this'd be the place to find out- have you ever encountered anything that could possibly have been those infamous Fleet Street-to-Bell Yard tunnels associated with Sweeney Todd and Margery Lovett? Just curious. I absolutely LOVE this entry! Thank you for opening my eyes to the idea of Urban Exploring. I apparently love everything underground. Have you heard of Throne of Drones? To me it was the perfect music for Neil Gaiman's Neverwhere and for the urban places you've introduced me to. Check it out. 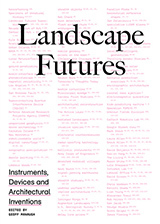 I have heard Throne of Drones; you might like the music of Tim Hecker, Main, Loscil, some Lustmord, James Plotkin & Mick Harris - in fact, if you're into ambient music, you might like this post here on the blog: Soundtracks for Architecture. Or even this one: Space as a symphony of turning off sounds. Thanks for reading! Glad you like the posts so far. Great item - thanks. Have just read Stephen Smith's "Underground London" & this led on to the fascination. 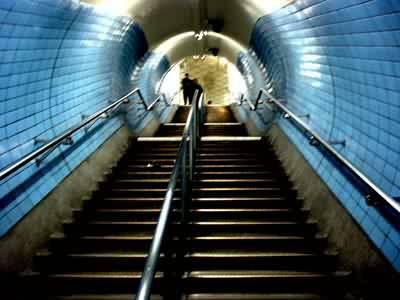 While in London this year my son & I came upon the foot tunnel under the Thames at Greenwich. We couldn't resist walking through.Great stuff.